Uptown Woodworks is the result of a search for a creative outlet and the need to decorate a new apartment. Feeling like he had a lot of creative energy bottled up, Garrett joined the maker-space, Nordeast Makers, in Minneapolis around Christmas time in 2015. A maker-space is like a gym - you pay a monthly fee to use the equipment. However, in this case, the equipment was laser engravers, CNC routers, 3D printers, and other tools. After learning how to use the equipment, Garrett started brainstorming things he could make. Around the same time, Garrett and Harrison moved into a new apartment in Uptown. Neither had much in the way of art or pictures to decorate their walls, let alone furniture. Both had done some woodwork with their fathers growing up so they decided they were going to make their own wall decor. 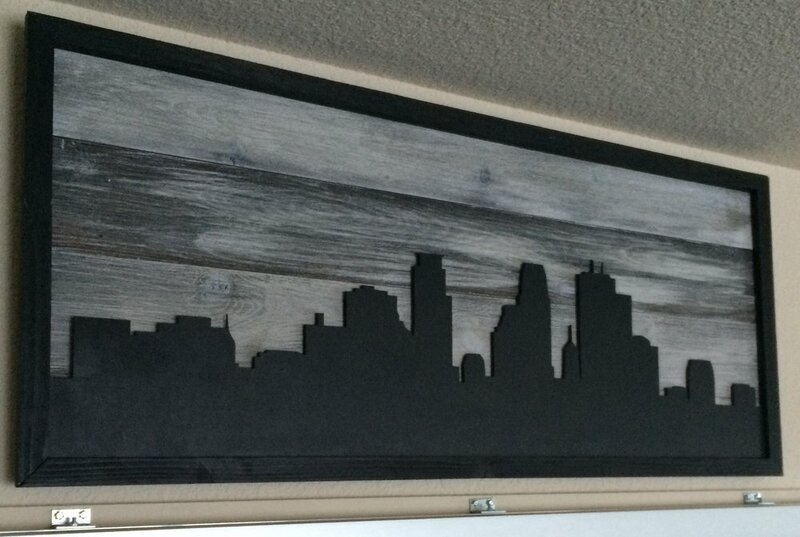 One of the first items Garrett created at the maker-space was the Minneapolis skyline pictured below. When he brought this piece home and hung it in their living room, friends took notice, especially Harrison. Seeing Garrett’s wooden skyline created from the shop’s resources hanging in their bare apartment gave Harrison a *lightbulb* moment; the one thing missing from most rustic spaces is rustic art that has personal meaning and truly captures the northern feeling. He had always been into design and this moment prompted inspiration to get involved with Garrett’s work. Together, they sat down and bounced ideas off each other quickly realizing that this could be more than just a creative outlet. They began looking for an opportunity to sell their artwork. At about this same time – only a week away in fact – the 2016 Minnesota State Boys Hockey Tournament was set to take place. They quickly decided to book a booth at the Let’s Play Hockey Expo next door to the tourney. After a week straight of 2am, 3am, 4am nights, they had built up enough inventory for the expo. By the end of the weekend Harrison had sold everything they had made for the expo providing a proof of concept. With that, Uptown Woodworks was born. Since then, they have expanded into making pieces other than hockey related art including lake maps, outdoor themed décor and celebrations of Minnesota. Because of this, they have been featured on Twin Cities Live and other media outlets. They absolutely love making projects that are special to the customer. Garrett grew up in Saint Paul where he spent much of his youth asking how the things around him worked. He was especially fixated on paper airplanes, even checking out books from the library to learn how to fly them further than before. An early entrepreneur, you could find him selling lemonade on the corner with his sister or friends on hot summer days. His curiosity and desire to create would lead to the foundation for what is now Uptown Woodworks. In his spare time, Garrett likes to cook, travel, play hockey, and run or bike throughout the city. Harrison called Lake Minnetonka home for 22 years and has always been obsessed with lake life. He grew up loving to play hockey, being outdoors and drawing. With his passion for design, he wanted to be an architect and design energy efficient, rustic houses that used natural elements. The 08 recession made him change his plans and go into marketing. When he is not at the shop, you can find him out on the lake, cooking, hanging with buddies on a rooftop, being nostalgic about MN or petting a dog.